To be honest, I have no clue where to start with this post. I have SO MUCH to tell you about Free The Children, We Act, and We Day Minnesota that I’m overwhelmed. I guess I’ll start with the fact that when someone from Free The Children asked me if I wanted to cover We Day Minnesota on our blog I had no clue how inspired I would be from it! Founded in 1995 by international human rights activist Craig Kielburger, Free The Children believes in a world where all young people are free to achieve their fullest potential as agents of change. We are an international charity and educational partner that empowers youth to remove barriers that prevent them from being active local and global citizens. 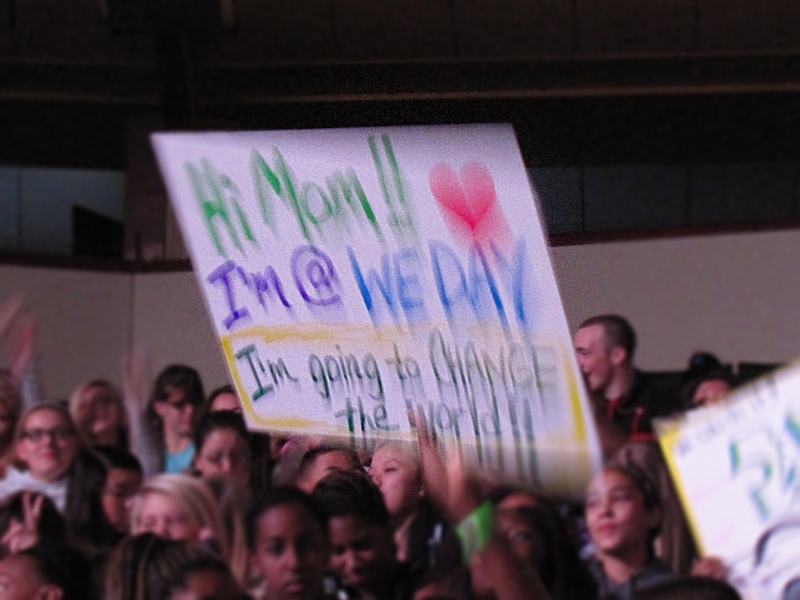 We work domestically through We Day events and the We Act program to educate, engage and empower 2.3 million youth across North America and the UK. Our international projects, implemented through our holistic and sustainable Adopt a Village model, have brought more than 650 schools and school rooms to youth and provided clean water, health care and sanitation to one million people around the world, freeing children and their families from the cycle of poverty. 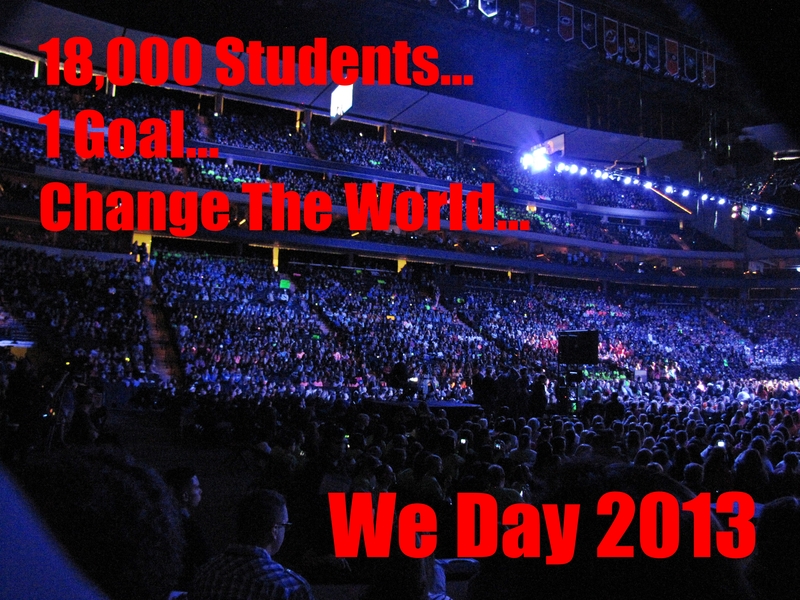 Students can’t buy a ticket to the one day We Day event, they have to earn it through service and making a commitment to take action on at least one local and one global initiative of their choice as part of the year-long educational program called We Act. 18000 students brought together in one stadium with one goal…to change the world. It doesn’t get more motivating than that! One third inspirational speakers such as Martin Luther King III, Her Majesty Queen Noor of Jordan, and Barbara Pierce Bush; one third concert with acts such as Dessa, The Tenors, The Jonas Brothers, and Carly Rae Jepsen; and one third local celebs such as Mark Dayton, Jack Jablonski and the Minnesota Vikings; We Day Minnesota was a star studded event full of energy and dedication to change. Where was something like this when I was a teen?! The most profound moment of the entire event however came when a girl named Molly Burke got up and told her story about being bullied at school because she was blind. You could hear a pin drop in the stadium when she was talking! I really could go on and on but I think this post is long enough. You’ll definitely be hearing more about Free The Children, We Act, and We Day throughout the year as this is something we can truly stand behind and get our kids involved in. For more information about Free The Children , We Act, We Day, the causes they support, and how to get involved yourself please visit their websites. I’m off to go make sure my school participates it We Act! Does your school support We Act? Do your kids help to make change? My Husband was there from the radio station and my friend UK DJ was the DJ for the day. Such a great cause!